Professional lead sheet and music engraving since the 1980's. Scot has made thousands of lead sheets, transcriptions, charts, and score reductions for his bands and his clients projects. Source material for lead sheets is anything from old hand written charts to sheetmusic and score reductions to transcribing music from virtually any source. All lead sheets and other music publishing is done with Sibelius software. Scot also offers personal Sibelius lessons and Sibelius tutorials. Professional quality charts and lead sheets make a big difference. As a working musician and sideman I know the value of good charts and lead sheets from years of first hand experience. I've also made thousands of charts and have a knack on making them extremely readable. No confusion, no questions, just easy to read music. You can hire the best musicians for studio sessions and club dates but if your charts are confusing or hard to read, your sessions will cost twice as much and your gigs will suffer as your sidemen struggle to make good music. When a vocalist hands me a folder of dog eared hand written charts covered in years of pencil marks, I know it’s the beginning of a long night. However, if it’s a book of professional charts that make it easy to play the music, I’m all smiles. 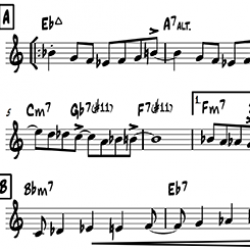 Work such as chart modernization – turn hand written and other old lead sheets into professionally published charts - usually doesn't take that long, but a transcription from an mp3 or video file usually takes longer depending on the complexity of the music and pitch/timing accuracy of the vocals. I give accurate estimates once I have the details and will normally cap the price at the high end of the estimate if the job takes longer than I anticipated. For larger jobs we can make a deal. Let me know what you need. All fees must be paid before I send you the chart(s). Next day service is available but it will depend on my gig schedule and what else is on the list. I started making lead sheets and charts in the 1980’s and have written charts for dozens of vocalists I’ve worked with, broken down orchestra scores into small band situations, and transcribed hundreds of songs and solos. I do lead sheet and chart work fast and accurately and will always work with you to get it right. Get sheet music from a video or recording just the way you want it. Your band can't play a video, you need lead sheets. My transcription and take down service turns music from any recording or video format into studio and stage ready charts. This transcription of Leslie Odom's version of, "Have Yourself a Merry Little Christmas", was for a pastor at a church who needed it fast so I got it to him the next day. When your hand written charts are hard to read from years of use, mark up, and musician sweat, it's time to get them professionally done. I use Sibelius software to make lead sheets and it's easy to change styles to suit my client's needs.